Jason Merrit/GettyPapa John’s founder and former CEO John Schnatter. Papa John’s sales fell by more than 10.5% in July, the month that Forbes reported the chain’s founder and former CEO had said the N-word on a company conference call. On Tuesday, the company said that it planned to spend up to $US50 million over the rest of 2018 on costs related to the scandal, including removing Schnatter from marketing, an internal audit, and additional legal costs. “Our future will not be defined by the words or actions of one person,” CEO Steve Ritchie said. Papa John’s is in the middle of a very expensive scandal. Founder and former CEO John Schnatter sparked backlash when Forbes reported in July that he had said the N-word on a company conference call. On Tuesday, the company reported that sales plummeted in July, falling 10.5% in North America in the month. Papa John’s reported it is now anticipating that comparable sales in North America will fall by 7% to 10% for the full year, down from the previous prediction of a decrease of 3% to flat sales. Executives said on a call with investors that the company planned to spend between $US30 million and $US50 million over the rest of the year on costs related to the scandal, including removing Schnatter from marketing, an internal audit, and additional legal costs. Since July, Papa John’s has removed Schnatter’s face from the company’s logo and marketing materials, eventually terminating his access to the company’s offices. Schnatter stepped down as chairman of the company’s board, a decision that he has since said he regretted. “Instead of addressing the real and fundamental issues confronting the Company since that time period, and taking actions to turn sales around, the Company is trying to deflect attention from the source of the problem – management’s ongoing failures with regard to financial performance – and blame me for its problems,” Schnatter said in a statement on Tuesday. At the end of July, Forbes published a follow-up report in which current and former Papa John’s employees accused Schnatter of inappropriate sexual behaviour.According to employees, Schnatter and other executives helped create a toxic culture at the company. Schnatter denied many of the allegations. 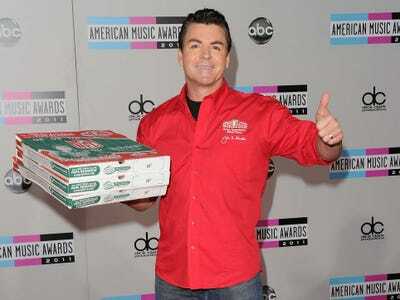 “A special committee of the Board of Directors, comprised solely of independent directors, has retained an outside firm to oversee an audit and investigation of the culture at the company and to make recommendations for whatever changes may be necessary,” Papa John’s said in a statement to Business Insider following Forbes’ report.